Rakusan did not include the Fan Series in his main sequence numbering. Therefore, the original number used for each of the 36 Series prints has been modified to identify the Fan Series members of its theme. The five different fan silhouette shapes have been here assigned arbitrary numbers 1 through 5. To indicate a fan design these shape designations are added to the 36 Series number separated by a hyphen. 133-3 is the Fan Series design with fan shape 3 in the 133 Clematis theme. Like all other designs in this series, 133-3 was only produced in a single print run, and few copies are currently documented. 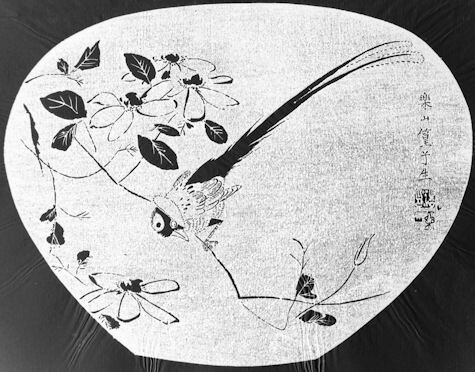 The signature and seal markings suggest that the designs in the 133 Clematis theme were produced in at least two stages. Two of the five fan designs in this theme and the 36 Series design 133 have seal C which indicates a carving date during the first half of 1934. Despite the early completion of some of its wooden blocks, Rakusan delayed printing and distribution of the prints in what became the 133 Clematis theme until the following year. It was eventually grouped with other summer season themes nearer to the end of the series. The other three fan designs (including 133-3) have seal B which suggests that those designs were carved closer to the time of publication. In the 133 Clematis theme, three of the five Fan Series designs (including 133-3) are taken directly from TBS, and the other two are original designs which are only partially in the TBS style. The 36 Series design 133 is also taken in part from TBS, but has been adapted in Rakusan's own style. 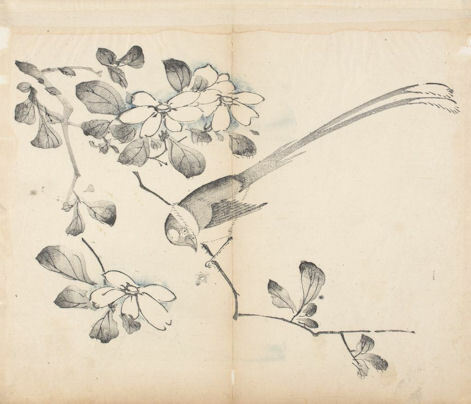 Asian Paradise-flycatcher, Terpsiphone paradisi, 変わり三光鳥, かわりさんこうちょう, カワリサンコウチョウ, kawari sankouchou, lit. 'variable three-lights bird', is native to China and Taiwan but is not found in Japan. Rakusan was copying an illustration in an ultimately Chinese source. 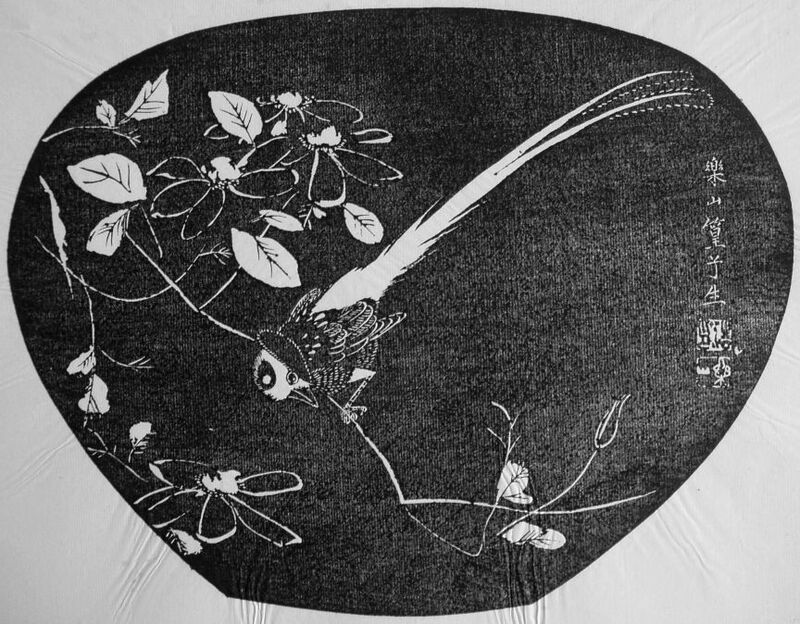 A closely related species, Japanese (Black) Paradise-flycatcher, Terpsiphone atrocaudata, 三光鳥, さんこうちょう, サンコウチョウ, san-kou-chou, lit. 'three-lights bird' occurs in 100 Series design 41 (and 41alt).